The prolonged and extreme cold spell we are currently experiencing across North America and Europe in December 2017 and January 2018 is due to the cooler than normal sea surface temperatures in the Pacific Ocean. This cooling effect started more than a year ago and seems to have continued. Back in June 2016, Earth Haven Learning Centre interviewed Dave Philips, Senior Climatologist for Environment and Climate Change Canada, and at that time, based on several international oceanic temperature monitors, Philips predicted a weak La Niña effect for the 2016-2017 winter. And that's how it turned out. We experienced a slightly colder winter and a prolonged and very wet spring. La Niña, which is Spanish for “the girl child” is characterized by the cooling of the equatorial waters in the central Pacific Ocean near the International Dateline. As this water mass cools down to at least 0.5 º Celsius (0.9 º F) below normal, it gradually influences the atmosphere overhead and the resulting movement of weather systems around the world. Its counterpart, El Niño, which is Spanish for “the boy child,” has generally the opposite effect. A warm pool of water over the Western Pacific Ocean moves eastward to the South American coast. The exceptionally mild winter across Canada in 2015-2016 was consistent with a strong El Nino effect. Generally La Niña encourages more tropical storms in the North Atlantic. In hindsight, the numerous and extreme hurricanes in the Caribbean from August to October 2017 corroborated La Niña's continued influence. While some meteorologists predicted another weaker La Niño effect for our current winter, others predicted a stronger one. And here we are in early January experiencing much colder than normal temperatures for several weeks. We can draw our own conclusions! Based on these colder than normal winter temperatures and our understanding of the La Niña effect, we are once again likely to experience a colder than normal spring, possibly even more so than last spring. An increased accumulation of snow will delay farmers getting onto their fields, and the surface melting of this snow into creeks, rivers and watersheds might create increased spring flooding. The extreme flooding last spring across the Great Lakes Basin was due to the larger than normal snowfall accumulation that previous winter. 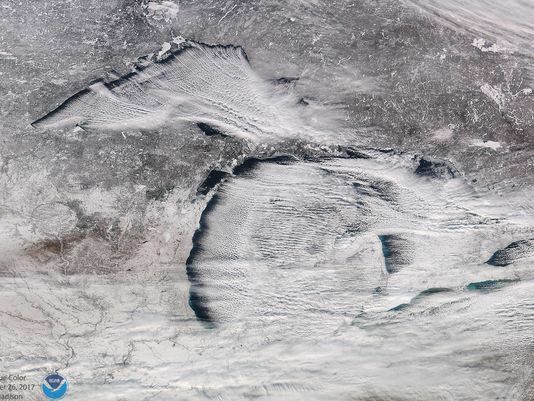 One consolation for all this cold weather is that the Great Lakes have just about completed freezing up and the “lake effect” snow resulting from unfrozen waters is minimized. In addition, all this extreme cold weather helps control the exuberant growth of the tick population. The old saying, “time will tell” is still relevant. Meanwhile, stay warm, keep an eye on the animals and make sure the pipes don't freeze.